If you do not want to back up or replicate some files and folders on the VM guest OS, you can exclude them from the backup or replica. Files exclusion reduces the size of the backup or replica but may affect the job performance. You can specify file exclusion settings granularly for every VM in the job or for the whole VM container. In the latter case, Veeam Backup & Replication will apply the configured rule to all VMs in this container. Disable file exclusion. Veeam Backup & Replication will back up or replicate the whole content of the VM guest file system. Exclude specific files and folders from the backup or replica. Veeam Backup & Replication will back up or replicate all files and folders except the specified ones. Include only specific files and folders in the backup or replica. 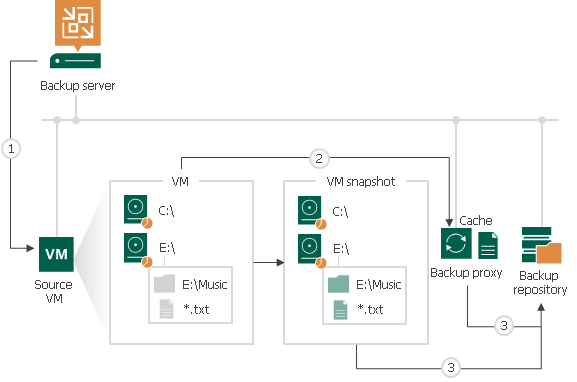 Veeam Backup & Replication will back up or replicate only the specified files and folders. Specify a full path to a folder on the VM guest OS, for example, C:\Documents\. Specify a full path to a file on the VM guest OS, for example: C:\Documents\MyReport.docx. If a path is not full, Veeam Backup & Replication will expand it relatively the root directory on the computer volume and attempt to detect such files on all computer volumes. For example, you have C, D and E disks on the VM. In the list of exclusions, you specify Document.docx. Veeam Backup & Replication will scan the whole file system and exclude the following files (if any): C:\Document.docx, D:\Document.docx, E:\Document.docx. If there is a C:\MyDocuments\Document.docx file, it will not be excluded — this file is not located in the root directory. Use environmental variables, for example, %TEMP%, %windir%. Environment variables must be defined for the user account that you use to connect to the VM guest OS and under which the runtime process is started. For example, you connect to the VM guest OS under the Administrator account. If you want to use the %windir% variable in the list of exclusions or inclusions, you must make sure that the %windir% variable is added to the list of user variables for Administrator on the VM guest OS. (*) — a substitution for one or more characters in the file name or path. Can be used for any sequence of characters (including no characters). For example, *.pdf. (;) — mask separator, for example, report.*;reports.*. In the table below, mask stands for any sequence of characters. All paths that contain the given sequence. If the asterisk character (*) is not specified at the beginning of the mask, the mask will be applied to all volumes on the VM guest OS, and Veeam Backup & Replication will include/exclude files and folders in the root folder on the volume: A:\mask*, B:\mask*, …, Z:\mask*. All paths on the specified volume that contain the given sequence. All paths that contain at least one of the given character sequences: *mask1* or *mask2* or *mask3*. Be careful when using masks with double wildcard characters. If you specify masks of such type, Veeam Backup & Replication will exclude all files and paths that contain the given mask. For example, if you specify the *.doc* mask, Veeam Backup & Replication will exclude files like MyReport.docx, Report.doc.txt and so on. File exclusion works only on Microsoft Windows NTFS. File exclusion is available in Enterprise and Enterprise Plus Editions of Veeam Backup & Replication. For more information, see www.veeam.com/backup-version-standard-enterprise-editions-comparison.html (File-selective image level processing). To exclude VM guest OS files, Veeam Backup & Replication must be able to deploy the runtime process inside the VM. For this reason, the VM must be running and accessible by an IP address, and credentials for application-aware processing must be valid. Veeam Backup & Replication supports both basic and dynamic disks. Volumes on the dynamic disks must not be split — spanned, striped and other types of split volumes are not supported. It is not recommended that you use VM guest files exclusion for Microsoft Windows Data Deduplication-Enabled Volumes. If you decide to use VM guest files exclusion for such volumes and set up a list of inclusions, you must add the System Volume Information folder to the list of inclusions. If you use file masks for file exclusion, Veeam Backup & Replication will need to scan the VM guest file system, and the time of VM disk processing will increase. The number of entries in the list of exclusions or inclusions must not exceed a few hundreds. 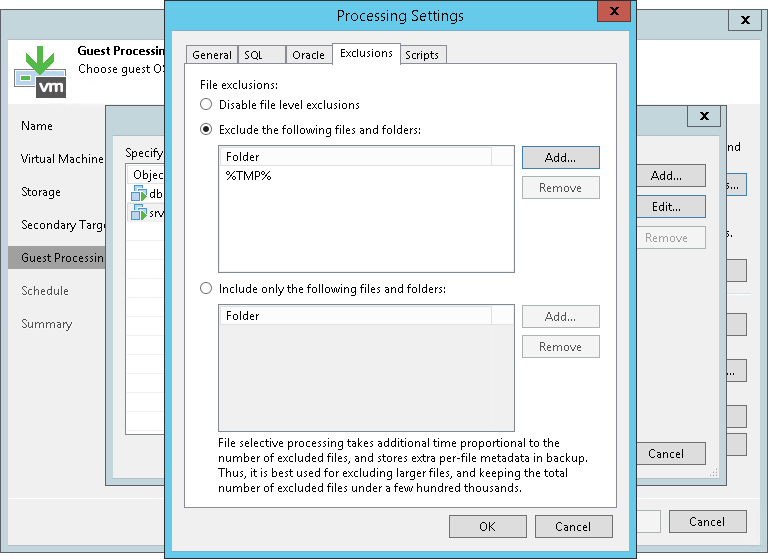 The number of entries in the list influences the job performance — the more files are included or excluded from the backup or replica, the more time Veeam Backup & Replication requires to process these files. It is recommended that you do not exclude system files without the necessity. Veeam Backup & Replication does not perform any checks to verify the VM image integrity. Exclusion of small files (less than 2 KB in size) is ineffective and will not reduce the size of the backup or replica significantly. To exclude the Archive folder from all volumes of the VM, you must add a relative path to the Archive folder the list of exclusions: ..\Archive\. To include only the D:\Documents folder to the backup, you must add the D:\Documents folder to the list of inclusions and, additionally, exclude unnecessary disks (that contain C:\ and D:\ volumes) at the Virtual Machines step of the wizard. For more information, see Step 4. Exclude Objects from Backup Job . Veeam Backup & Replication checks the job settings to identify what VM guest OS files must be excluded. Veeam Backup & Replication opens the MFT file from the VM guest file system in the memory cache on the backup proxy, and marks data blocks of excluded files as deleted. When Veeam Backup & Replication copies VM data to the target, it reads data both from the VM snapshot and memory cache on the backup proxy. On the target, Veeam Backup & Replication creates a "merged" version of VM disks that do not contain excluded VM guest OS files. Due to data compression, data blocks that are marked as deleted are compressed, and the size of the resulting backup or replica file reduces.